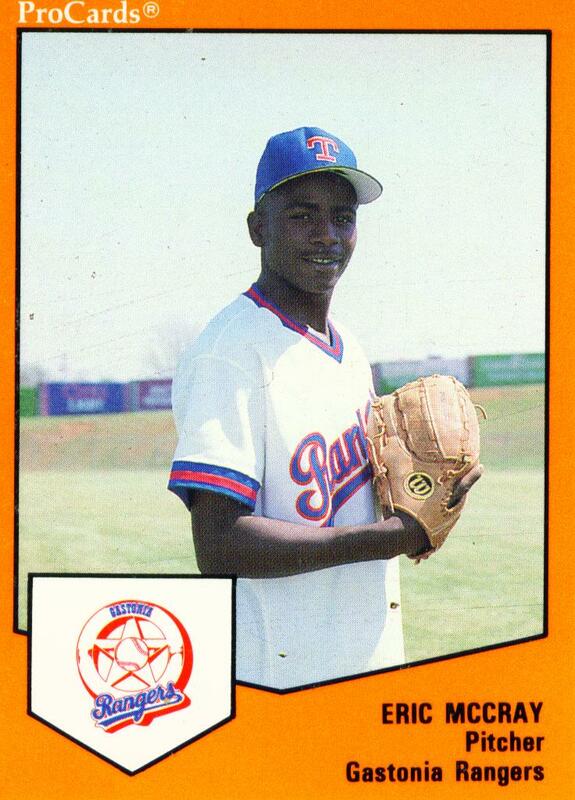 Texas Rangers Cards: Minor League Monday - Eric McCray, 1989 ProCards. Minor League Monday - Eric McCray, 1989 ProCards. Good thing the Rangers aren't playing tonight. They've been off the past couple of days. At least they won't lose if they don't play. Hopefully the day off will help them get rested and ready to rumble in the drive up to the All-Star break. Since there's no game I thought it would be a good time to take another trip down to the farm. The Rangers drafted Eric McCray, shown here on card number 1008 of the 1989 ProCards set, in the 1988 draft. He was their 10th selection in the draft. Texas started the lefty at Rookie ball in 1988. He posted a 1.44 ERA in 56.1 innings as a starter. That was good enough for a promotion to Single A Gastonia for the 1989 season. McCray's success would continue at Single A. His ERA climbed a bit but was still a nice 2.52. His WHIP inched up to 1.233 but that was still acceptable as well. In the 22 games he started for Gastonia he more than doubled his innings pitched to 121.2 and posted a 7-7 record for the season. He struck out 110 while walking 55. He could stand to lower the walk totals but for a lefty in just his second season of pro ball he was doing well. All in all Eric's first two pro seasons had gone well. The tenth round pick had been a pleasant surprise and would be promoted to Double A for the 1990 season. Here is where the real climb to the Majors would begin. McCray would have to translate his early success to the higher levels of play if he wanted to pitch in Arlington. 1975 Topps - Jim Bibby. Senators Saturday - Jim King, 1962. Best Seasons: Jenkins - 1974. Post for June 16, 2011. 1974 Topps - Cesar Tovar. Minor League Monday - Joe Lewis, 1989 ProCards. Young finds bat as Rangers get elusive win. Scott Coolbaugh makes it to The Bigs again. 1974 Topps - Bill Sudakis. Minor League Monday - Carl Randle, 1989 ProCards. Of Colby, Baby, and cards.